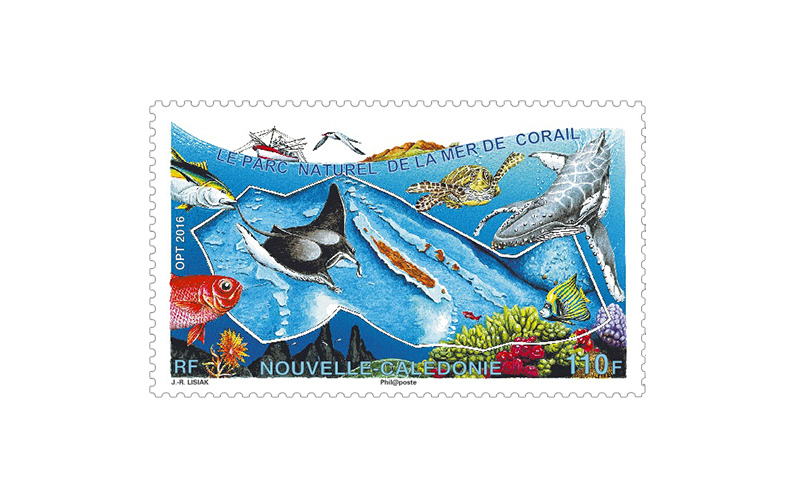 This new 110 XPF stamp issue, designed by Jean-Richard Lisiak, celebrates the Natural Park of the Coral Sea, established by the Government of New Caledonia on 23 April 2014. 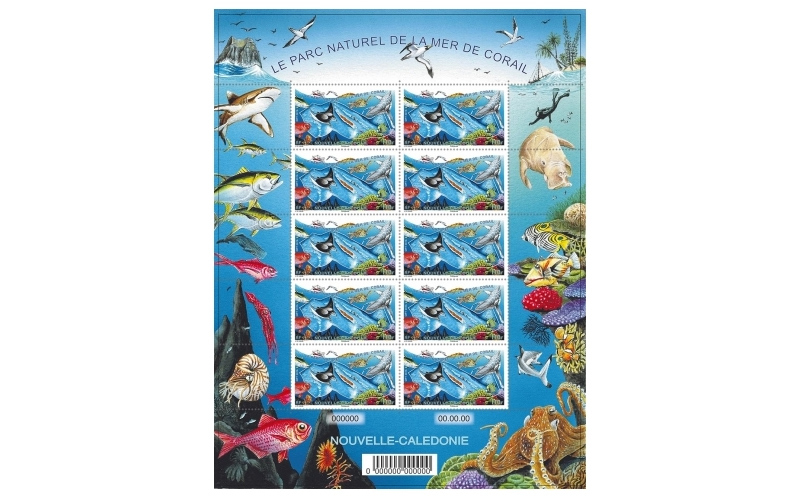 Stretching over 1,291,000 km million km², the Natural Park of the Coral Sea encompasses all of New Caledonia's exclusive economic zone and is the most expansive wilderness preserve anywhere, on land or at sea. Sheltering a wealth of ecosystems supporting outstanding biodiversity, and home to a menagerie of wildlife, this vast ocean sanctuary is dotted with remote islands and contains more than 445 thousand hectares of coral reefs. In addition to the vital role it already plays in community terms (fishing, shipping routes...), the reserve offers excellent perspectives for future economic activity and development. Seen as a source of potential wealth, the park was created with the aim of providing New Caledonia and key marine environment stakeholders with the means to engage with and manage the challenges posed by environmental protection and sustainable development. Primary management priorities include involving people at all stages of the project, preserving and enhancing marine ecosystems and resources, ensuring sustainable marine economy development and contributing to the international framework for ocean governance and conservation. Setting an example of proactive preservation, the park will also play a key role in furthering regional cooperation between New Caledonia and the Pacific Rim countries bordering this vast expanse of ocean, particularly Australia with its Great Barrier Reef. A management committee comprising major institutional, customary and socio-professional players, together with civil society leaders, is currently working on the development of an integrated management plan.